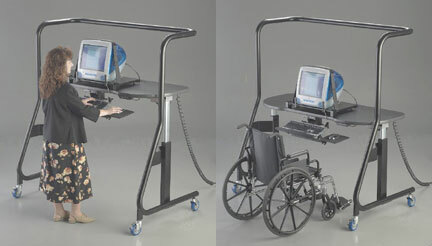 New Model 500 height adjustable workstation: ideal for standing, seated or supine work positions. 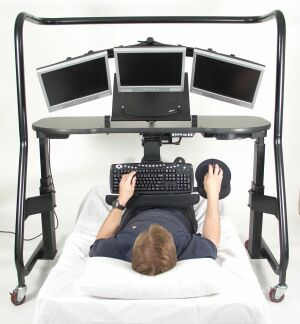 Programmers, CAD workers, graphic designers or special needs individuals now have the ideal station for hours at the computer. 1. Work Surface: durable 1.5″ thick medium density board with black laminate and rubber-molded edge. 4. 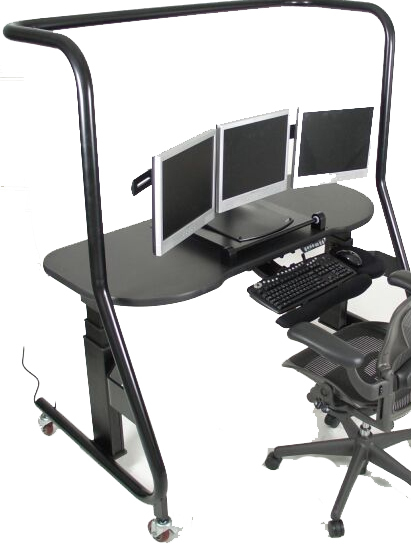 Motorized legs: raise and lower table to and up to 400 lbs. 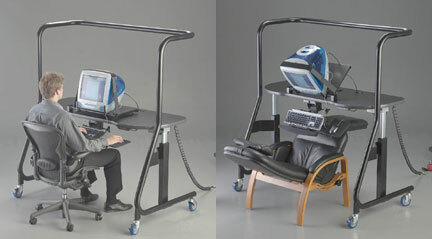 of equipment from 31 to 50 degrees with the push of a button, for use in sit, stand, or recline position with minimal effort. 5. 5″ Casters: Heavy-duty, ball bearing casters with elastomeric wheels to provide smooth movement. Front two casters are locking. 8. Cord management grommets: two 3″ diameter holes with plastic grommets provide power strip access below the tabletop. 9. Powder-Coated Steel Tube: The 2″ diameter steel tube frame eliminates a need for cross members beneath the work surface. 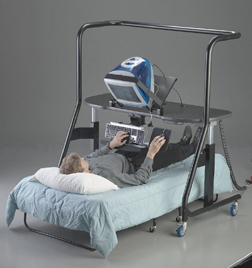 They provide maximum clearance for recliners, beds and wheelchairs. Durable finish resists scratching.